The themes in the novel The Catcher in the Rye provide the reader with considerable depth and understanding, but it is the motifs that enhance this knowledge and make a clear set of images for the reader. This is a topic suggestion on Motifs in Catcher in the Rye from Paper Masters. Use this topic or order a custom research paper, written exactly how you need it to be. The themes in the novel The Catcher in the Rye provide the reader with considerable depth and understanding, but it is the motifs that enhance this knowledge and make a clear set of images for the reader. One of the most common motifs in the story is the idea of loneliness, particularly centered on the primary character of Holden. The entire course of the novel focuses on his desire to find companionship, platonic or otherwise. However, at the same time, he values his isolation, keeping an air of mystery to his character that he is rather unwilling to remove. Many of his activities and his interactions with characters reflect this quest for isolation, when the reader secretly knows that he himself is conflicted. An equally common motif in the novel is the notion of phoniness and deception, particularly self-deception. Holden at various points in the novel criticizes others for being deceptive or secretive; he himself displays these qualities on numerous occasions, however. He is unwilling to admit his faults; he does not consider how his actions might impact others in his life. Hypocritically, however, Holden is most hateful toward people who refuse to admit their own problems or who pretend to be something they are not. This motif just adds an other layer of depth to Holden’s character, creating a situation in which he can neither be truthful to himself nor continue to lie to others. To admit his shortcomings would belie his character; to not do so makes him a hypocrite. Holden Caulfield as a Saint - Holden Caulfield as a Saint term papers examine the possibility that Salinger meant his main character in Catcher in the Rye to be better than man. Holden Caulfield's Quest - Holden Caulfield's Quest term papers look at J.D. 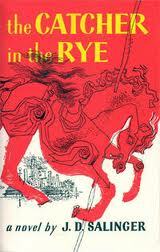 Salinger's portrayal of Caulfield's quest in Catcher in the Rye. Symbolism in Catcher in the Rye – As a quintessential piece of American literature, Catcher in the Rye has been studied time and time again, looking at themes, setting, characterization, and, most importantly, symbolism. Paper Masters writes custom research papers on The Catcher in the Rye and discuss the themes in the novel and provide the reader with considerable depth and understanding.